With ransomware attacks growing in both number and sophistication, organizations need a solid, multi-layer defense strategy that helps them block attacks and quickly discover any infections in progress, so they can limit the impact on data and operations. A solid file backup and recovery process is of top importance among these measures. 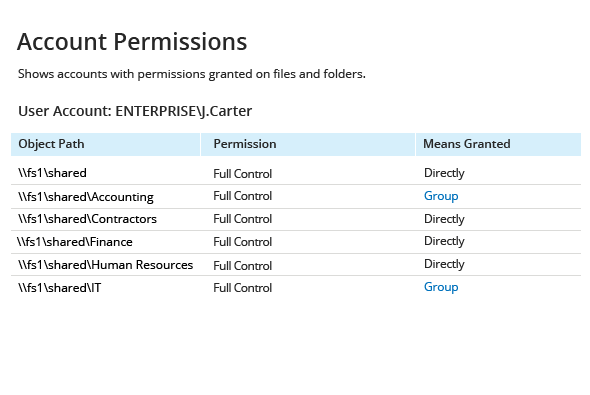 See who has 'full control' access permissions for shares and folders that they access infrequently. Removing excessive permissions to access sensitive and critical data limits the power of ransomware. You can also review Stale Data report to discover which data is not being actively used, and either move that data to a protected archive or encrypt it. Verify the appropriateness of user access rights by reviewing each user's assigned permissions to files and folders against HR employee listings and employee job descriptions. 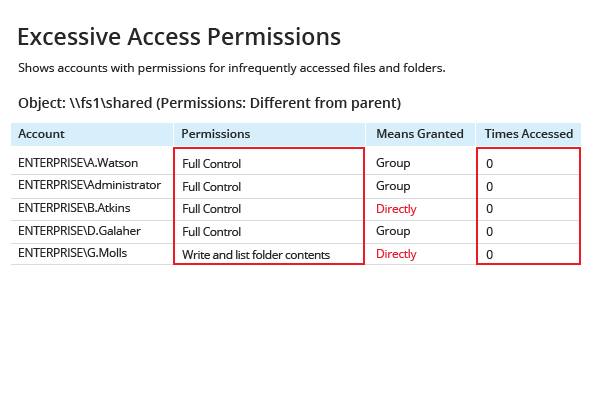 See what account permissions are associated with particular critical files and shares and how those permissions were assigned to users – directly or through group membership. 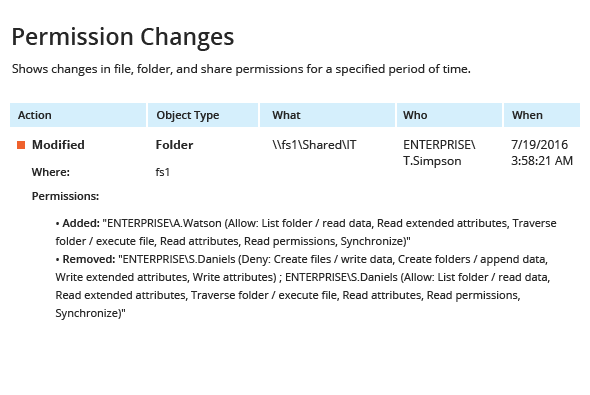 Enable control over privilege escalation by reviewing detailed information about all changes to file, folder and share permissions. 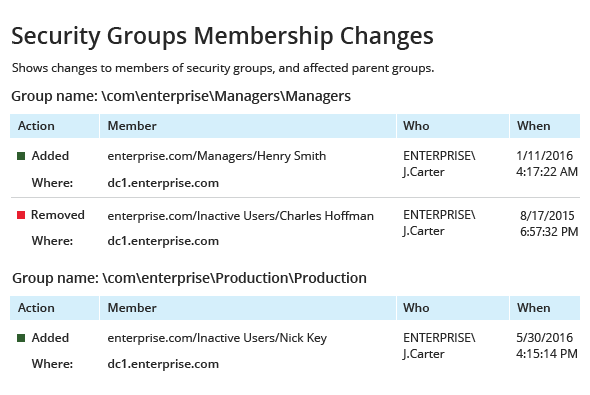 Detect improper delegation of access rights by reviewing detailed information about all changes to security group membership. Encryption ransomware can have any file extension, including .bat, .msi or .exe. Blocking the typical ransomware extensions in your Software Restriction Policy is a good security measure that helps you prevent malware from running. Netwrix Auditor keeps you informed about any removals of file extensions from the policy list. It also reports about all registry key changes that might indicate ransomware attempting to enable the autorun service. 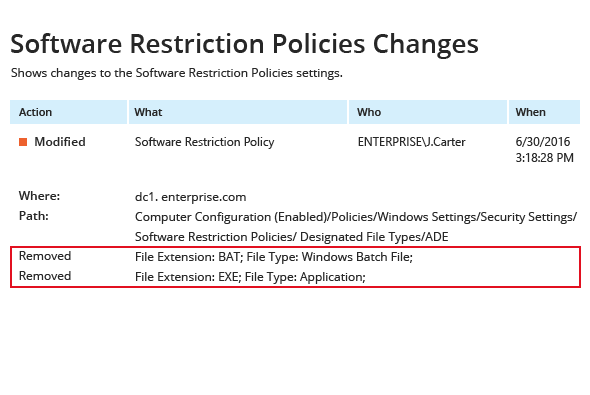 Review the Software Restriction Policy Changes report to learn about any changes to the list of restricted file extensions. Review other predefined Group Policy change reports to control any improper additions into your application whitelists. 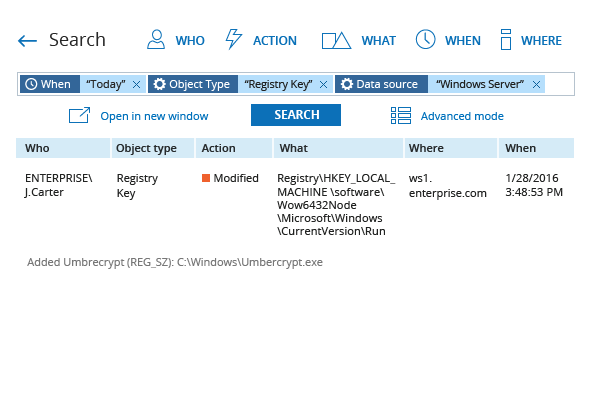 Use the Interactive Search feature to control additions to the Windows registry startup keys, paying particular attention to the Run key settings. 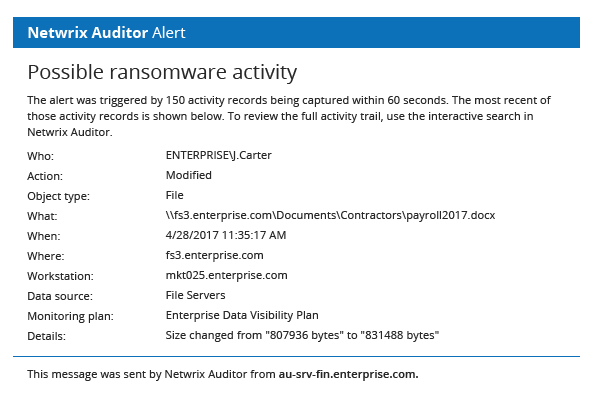 If ransomware has already changed these settings, Netwrix Auditor will show you the path to its execution file, facilitating the removal and remediation process. 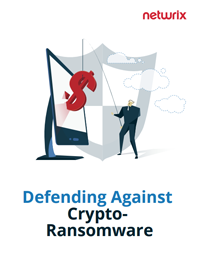 When crypto-ransomware manages to avoid detection by antimalware solutions and starts running, time is critical to limiting the scope of the damage. The earlier you can figure out that something is happening to your data, the sooner you can contain the situation and the less data you will lose. Netwrix Auditor audits all user activity on your file servers and enables timely detection of anomalies that may indicate ransomware on the loose. 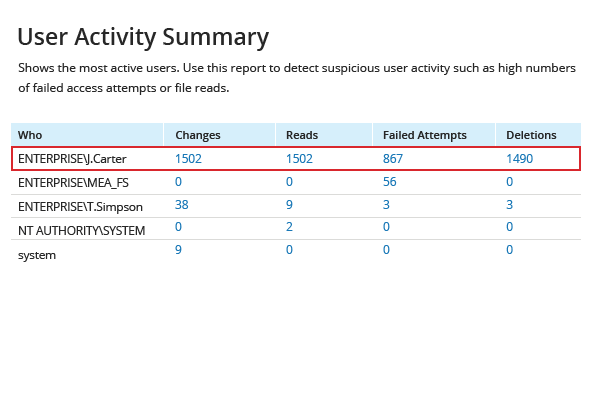 Review the User Activity Summary report to detect suspiciously high numbers of file reads, failed read attempts, file changes and file deletions, any of which can be indicative of crypto-ransomware in operation. The report also shows you the user account whose access rights were used to encrypt your data. Enable an early warning system and detect a ransomware attack in progress using threshold-based alerts that will keep you aware of any anomalous file activity on your servers. You can choose from a list of predefined alerts or use the flexible criteria to specify your own pattern of behavior that you consider risky. Recovering from a crypto-ransomware attack usually requires restoring data from a backup kept isolated from your network. Netwrix Auditor helps you identify the affected files to enable a faster, more efficient granular restore. 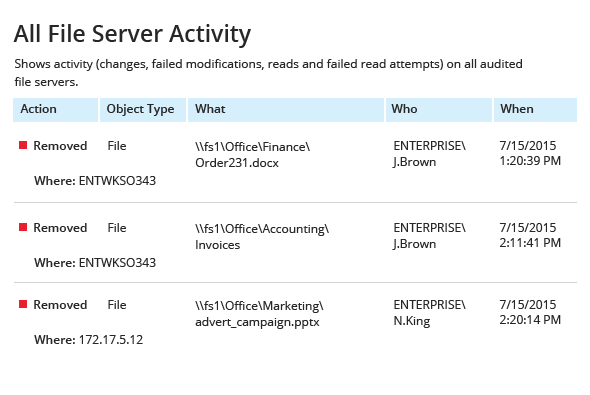 Review the All File Server Activity report to see detailed information on which files were accessed, changed or deleted on your file servers during a certain time period and under which user account those changes were made. 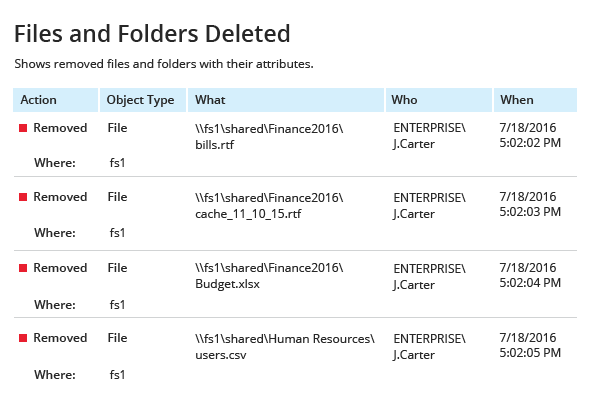 Use the Files and Folders Deleted report to see a complete list of files and folders that were deleted by the ransomware. Discover essential best practices that can help you mitigate the threat of encryption ransomware. Learn more about crypto-ransomware and how Netwrix Auditor can limit the damage it can do.